The Purchaser will pay to the Seller the amount of $0.00 USD on or before the 19th day of April, 2019 (the "Closing Date") as payment in full for the Property. The Purchaser will take possession of the Property on the 19th day of April, 2019. This Document accurately reflects the understanding between the Seller and the Purchaser, signed on this 19th day of April, 2019. 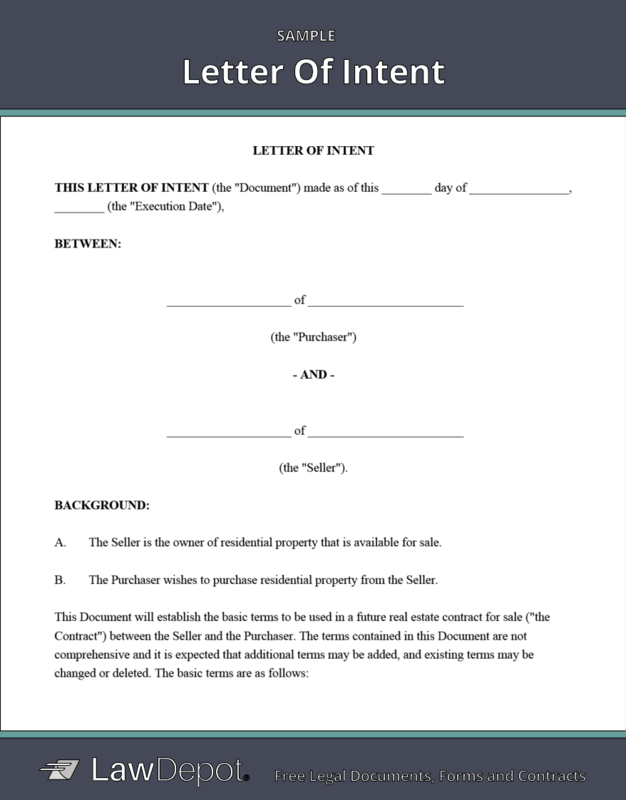 A Letter of Intent (LOI) is a statement of understanding between two parties. LawDepot's Letter of Intent is non-binding, meaning that the parties are not legally required to follow through with the terms of the agreement. The LOI acts as a foundation for a definitive agreement. By agreeing to the Letter of Intent, both parties intend to continue negotiations in good faith. When two parties agree to good faith obligations, it means that they are both sincere in their intent to act and carry out their promise. Either party involved in a business or real estate transaction can create a Letter of Intent to set out terms for a deal. For instance, an interested buyer might submit an LOI to a seller as a formal way to make an offer on a business. At that point, the seller could review the terms in the letter and decide if they wish to move forward with the purchase or if there are negotiations needed beforehand. If the seller agrees to the content in the LOI, they would give their approval to move into the next stage of the transaction. In business or real estate transactions, the purpose of an LOI is to provide an overview of the purchase details in advance of a binding agreement. It allows the seller to evaluate their options before agreeing to the terms with a buyer and saves on the costs involved with negotiation and due diligence. Residential Lease Agreement: A Residential Lease Agreement is a document that a landlord and tenant both sign when a tenant is renting residential property from a landlord. Purchase of Business Agreement: A Purchase of Business Agreement is used when an individual or business purchases all the shares or assets of a business. Real Estate Purchase Agreement: A Real Estate Purchase Agreement records the purchase and sale of a real estate property. Personalize your Letter of Intent template.